( This page has videos that try to capture something of the atmosphere of a performance or of playing in nature. So far, however, almost all of the videos I have put online are there for teaching purposes: as can be seen in those examples the camera is so close to the action that the qin is disproportionally large. The aim there is to mimic the setting where a student sits facing the teacher and learns by copying. Here, instead, are videos that put more focus on atmosphere. Opening scene of the documentary film Music Beyond Sound. From a 1989 Taipei concert in honor of my teacher Sun Yuqin being named a National Living Cultural Treasure. Around that time I was experimenting with the use of nylon metal strings; see also performance attire. Most of the videos currently online here are .mp4 files with sizes ranging from about 30 MB to over 100 MB per minute. Depending on the computer, it may be possible to play them simply by clicking on them, or it might be better first to download them onto a computer. 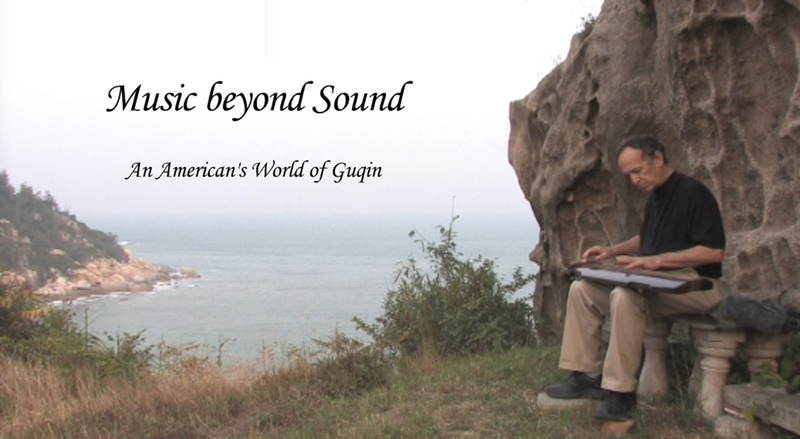 This two hour documentary by 劉成漢 Lau Shing Hon is called 希聲，一個美國琴人的境界 Music Beyond Sound ： An American's World of Guqin"; made over 10 years, it was completed in 2019. The opening scene was shot by a rock overlooking the South China Sea on Cheung Chau Island, where I lived for 24 years and still maintain a residence.